Radio science conventionally studies the planets and their atmospheres as well as the solar wind via their effects on the amplitude and phase of radio signals between a spacecraft and a Deep Space Network station. The measurements are conventionally made at the earth station. For some observations, scientific return can be improved if the measurements were made at the spacecraft. These measurements are accomplished by taking advantage of a high transmit power signal from a ground station with a very large antenna and the received signal with a high Signal to Noise Ratio reaching the spacecraft. Recent advances in CubeSat technologies present a real opportunity to fly a future space qualified Radio Atmospheric Sound and Scattering Instrument (RASSI) with the capability to record key Radio Science observables and also perform any required data post-processing onboard the spacecraft. In 2007, JPL built and successfully tested an engineering model of RASSI. For the purpose of this paper, we will assume that a flight RASSI is available to be integrated it with CubeSat bus. The interface between the two modules will be accomplished through a power switch, which will activate RASSI by CubeSat computer command, and also will enable RASSI science data and health & status telemetry to be relayed to the ground via the CubeSat telemetry transmitter. CubeSat bus is also assumed (at a minimum) to provide structure, computing, thermal management, ranging, attitude determination and communications: transmit telemetry and receive commands in S-Band and have the capability to coherently translate the uplink carrier signal and transmit it back to the ground station without any modulation. RASSI is expected to meet the allowable CubeSat mass and volume specifications and it will provide dual band capability of receiving an X-Band uplink carrier from a Deep Space Network (DSN) and S-band OR UHF signal from earth or a space asset in orbit. 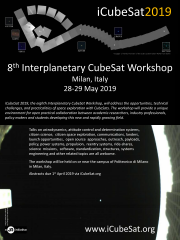 In this paper we will review opportunities and benefits for using Interplanetary CubeSat in conjunction with RASSI to improve Radio Science accuracy measurements in uplink (atmospheric, ring or surface) and crosslink (signals transmitted between two spacecraft) observations.